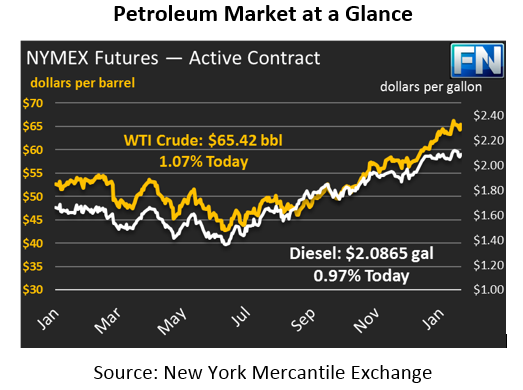 Despite falling crude inventories, prices shot higher yesterday. After starting well below Tuesday’s closing price, Wednesday’s prices gained 70 cents. Today, crude prices are continuing to rise, adding 69 cents (1.1%) and trading at $65.42. Refined products are rising along with crude. Diesel prices ended yesterday just shy of Tuesday’s closing price, but today prices have surpassed that threshold and continued rising. Diesel prices are currently up 2 cents (1.0%), trading at $2.0865. Gasoline managed to post huge gains yesterday after falling Tuesday night; after opening low, gasoline prices roared back with a 2.8 cent gain. Today, gasoline is still rising but without the energy. Gasoline prices are currently $1.8986, a smaller 0.5 cent (0.3%) gain. Markets are rising despite an overall bearish report from the EIA. Crude inventories rose by 6.8 million barrels, the first build since November. The large build helped make January a less historic month – although crude stocks generally build in January, this week’s large build brought the total monthly draw to just 1.2 MMbbls, less than the last few January draws seen in 2004, 2003, and 2000. The EIA reported falling refinery run rates, which brought refined fuels out of the market and contributed to gasoline and diesel stock draws. Import and export activity rose as well, and a net increase in imports added three million barrels to crude stocks this week. Worth noting is that the Brent-WTI spread that has spurred exports in recent months and has narrowed significantly. Above $6/bbl at the beginning of the year, spreads are now hovering just above $4, after dropping to $3.90 a couple days ago. Efforts to increase export infrastructure appear to be paying off, and with spreads narrowing, expect to see exports taper down somewhat in the coming weeks.